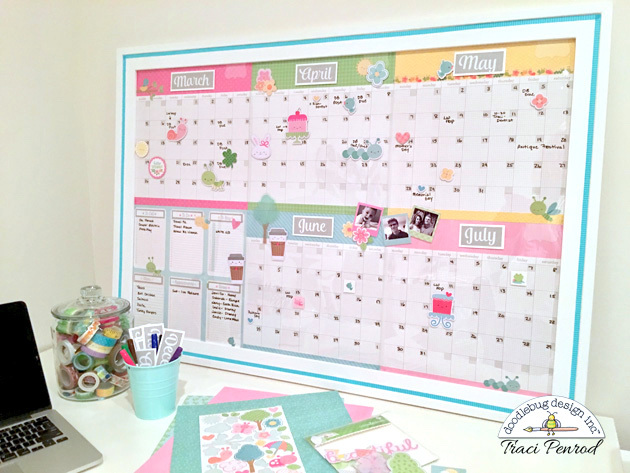 Hi everyone, Traci here to share my Calendar Challenge project with you. I recently moved into a new craft space and I've been needing a visual reminder of due dates and to do lists on the wall near my desk. 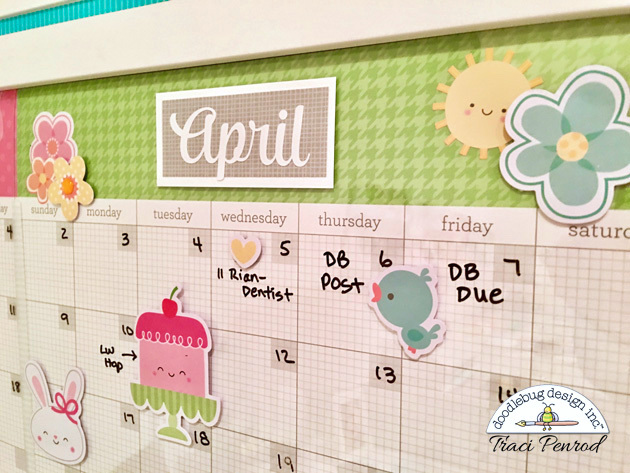 When I learned about this design team challenge, I was excited about creating a magnetic calendar for my room. To make my calendar, I adhered 5 sheets of 12x12 Daily Doodles calendar paper, and 1 sheet of Love You Lots double-sided card stock to the front of a 24"x36" magnetic board purchased from an office supply store. 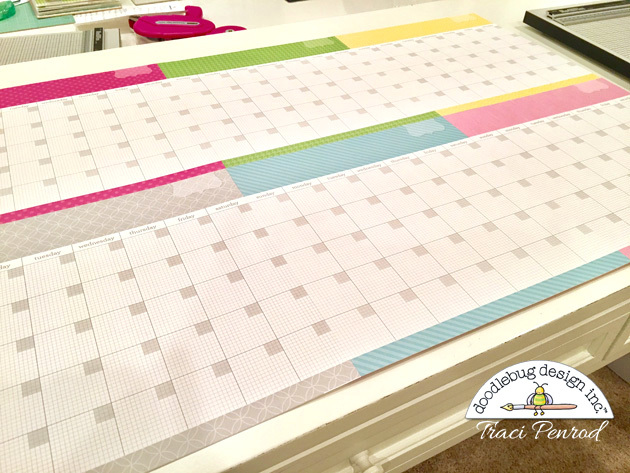 I started out with 6 calendar sheets, but then decided to add the cute sheet for lists. I made labels for my lists, and matted them on Stone Grey linen paper. I adhered these directly to the 12x12 sheet. 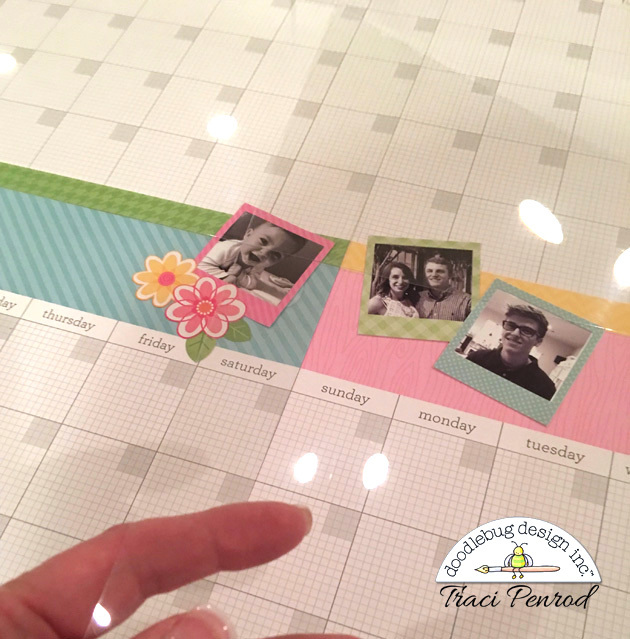 Although I wanted my calendar to have glass on the front, I quickly realized that the magnets wouldn't work through glass, so I moved on to 12x12 sheets of clear acetate. Before adhering my acetate over the calendars, I added a few stickers to the calendars that I wanted permanently adhered under the plastic. 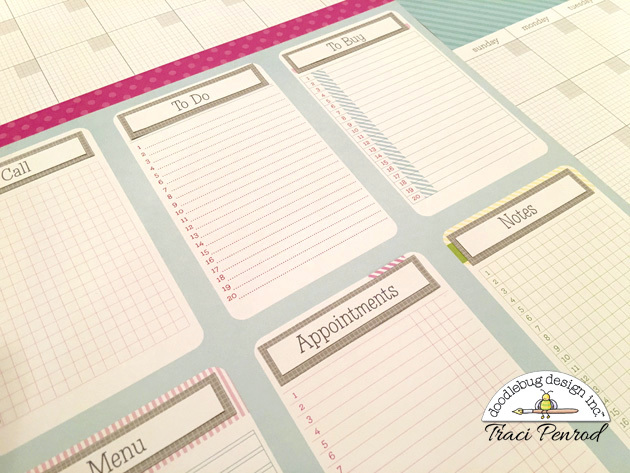 Then, using tiny glue dots in each corner, I adhered 6 sheets of 12x12 clear acetate over each calendar and the list sheet. 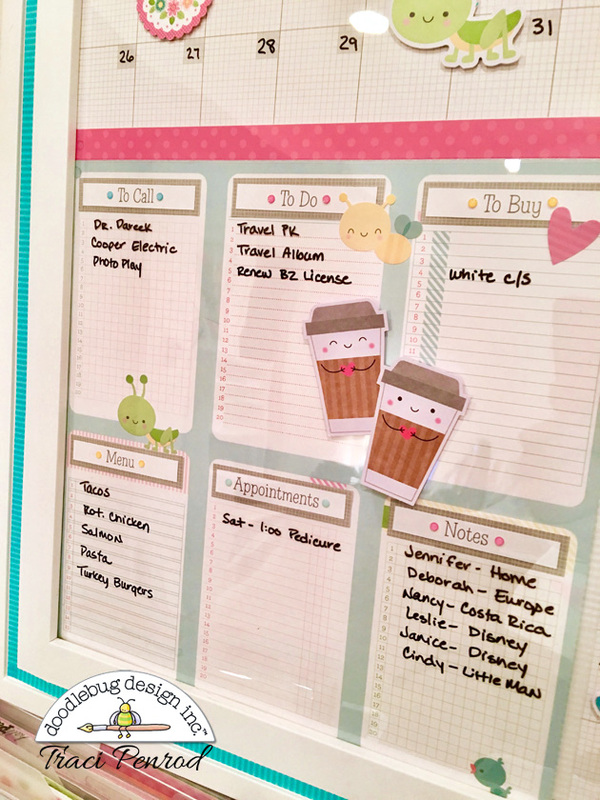 I used the Daily Doodles Month stickers to create a magnetic label that can be changed out for different months. I also added pieces of heavy magnetic tape to the back of some Spring Things and Cream & Sugar die cuts and stickers. 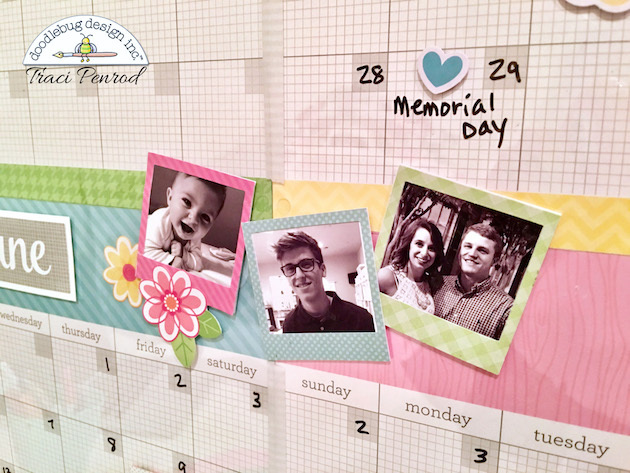 I even added a few family photos behind the little die cut frames ... love these! I am a huge fan of glitter sprinkles so they had to be on my calendar ... I adhered them on the acetate to dress up my list labels and flower centers. So that's my project for you today ... it's definitely the largest one I've done :), but I love it. 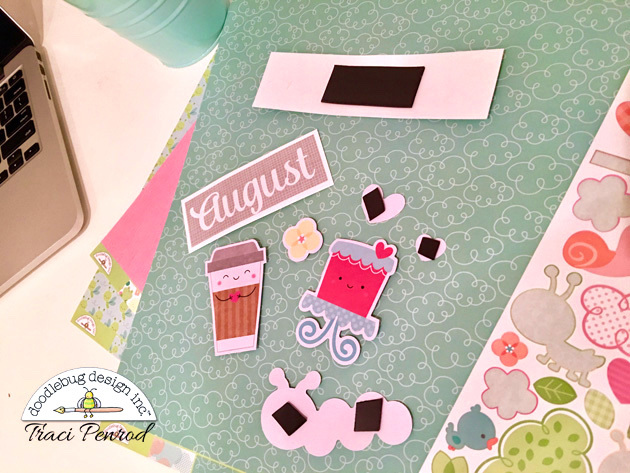 I hope I've inspired you to have fun creating with Doodlebug's Daily Doodle pages too! This is AMAZING!!! I need one for my craft room!!! !